Bloodstone is is composed of deep Green Chalcedony and small dots of Red Jasper. It is also known as Heliotrope. Bloodstone is a powerful healing stone used for thousands of years for its healing properties. It is often used to purify and detoxify the body. Great at grounding negative energy and cleansing the body, Bloodstone brings love into any situation and helps ground the negative energies surrounding that issue. Bloodstone assists in enhancing the functions of the mind, bringing clarity and understanding to subjects that were unfamiliar. 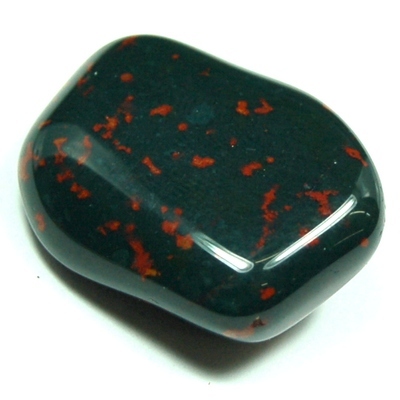 Bloodstone has been used to increase energy and strength. It removes energy blockages, which in turn, creates a smooth and constant energy flow throughout the body. Bloodstone can help to enhance intuition and creativity, and can be used to combat fatigue, irritability and confusion. It is good to keep a Bloodstone in any place that needs its energy cleansed. Click here to see Bloodstone in our online catalog. Affirmation: I live in the present moment. Question: Do you believe that crystals can support physical healing?